The Institute of Metaphysical Humanistic Science Degree Program is administered under the direction and tutelage of Dr. Douglas Kelley who has researched and taught human development for nearly four decades. He is the author of scores of courses, books, audios, and concepts on a variety of metaphysical topics. Dr. Kelley has designed the IMHS Degree Program especially for busy people who want the knowledge and degree, but who simply cannot spend several years in getting it (as is normally required). 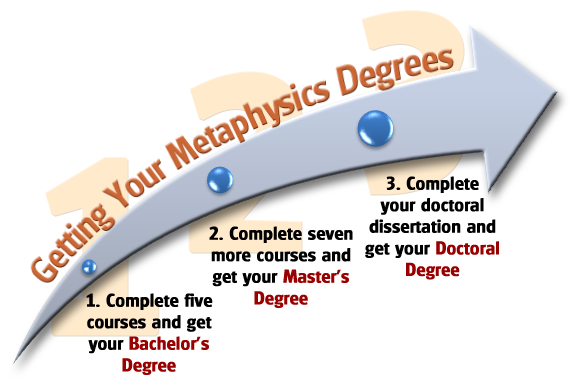 Our metaphysical degree program is simple; we have streamlined it by offering Bachelor's, Master's, and Doctoral degrees in an accelerated format to save you time and money thereby allowing you to use your knowledge and degree much faster than usual. If you complete just one course per month, you will complete the entire Bachelor's, Master's, and Doctoral Programs in 12 months. Or, you can take several years if you wish. The average IMHS student completes all three degrees in 13 months. Several tuition plans are available and you can start with as little as $100 down. Begin your metaphysics degree program with the five Bachelor's Degree courses which lay a critical foundation in metaphysical philosophy and practical life-skills that are crucial to your area of specialization regardless of which one you choose. To graduate with your Bachelor's Degree, complete the five Bachelor's courses. Once you graduate with your Bachelor's Degree in Metaphysics, you will receive your digital Diploma (PDF) and can put the letters "MHs.B" after your name. 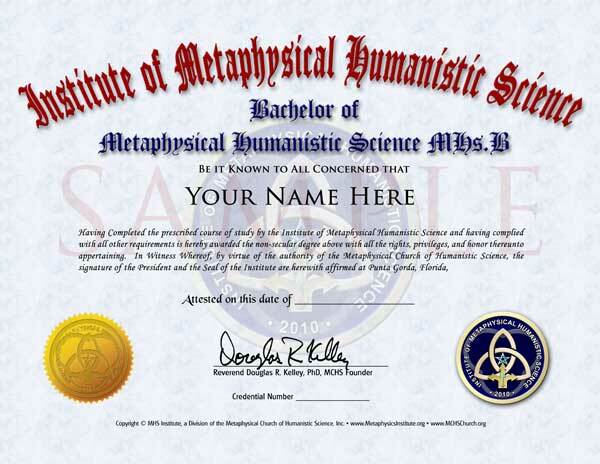 Only interested in a Bachelor's Degree in Metaphysics? No problem! Simply stop here (Bachelor's Degree Assignment is required for students who stop here. Additional fee applies). To graduate, complete the Bachelor's courses plus seven more courses required for your chosen specialization. Once you graduate with your Master's Degree, you will receive your digital Diploma (PDF) and you may put the letters "MHs.M" after your name. 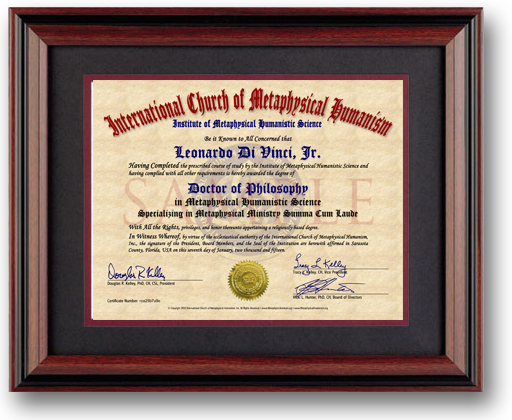 Printed versions of the certificates above are sent with your Doctoral degree documents. If your specialization requires it, you can apply for ordination from ICMH Church or use your ordination from another bona-fide religious institution (ordination is required for the specializations of Metaphysical Ministry, Spiritual Counseling, Life Coaching, Holistic Healing, and Hypnosis). Once you graduate with your Doctoral Degree, you will receive both printed and PDF versions of your Doctoral Diploma, Ordination Credential, Practitioner's Certificate (if applicable), Letter of Good Standing (if applicable), clergy ID badge (with holder and lanyard; if applicable), clergy dashboard parking sign (if applicable), and various blank marriage and other certificates for your use. You will then be able to put your choice of one of several designations after your name including "MHs.D," "PhD," "D.Min," or "DD," and can be called "doctor." Purchase a nice frame and you will have an elegant and well-earned credential to grace your wall. Since IMHS is an online school, it is only logical that our graduation ceremony should also be online. This allows students from all around the world to participate. Graduations are held the first Saturday in May. Any student graduating with their Bachelor’s, Master’s, or Doctoral degree prior to this month may participate. Participation is optional. The International Metaphysical Practitioners Association (IMPA) is good for students specializing in Metaphysical Ministry, Spiritual Counseling, Life Coaching, Holistic Healing, and Hypnosis. IMPA is a professional association of metaphysicians that will enhance your credibility. You can also interact with others as well as share ideas and accomplishments. ParaNexus Association of Anomalous Researchers is good for student specializing in the paranormal sciences. ParaNexus is a professional association of anomalous researchers that will enhance your credibility. You can also interact with others as well as share ideas and accomplishments.